An American astronaut, a Russian cosmonaut, and the man who will become Canada's first space station commander are readying to launch to orbit Wednesday (Dec. 19). 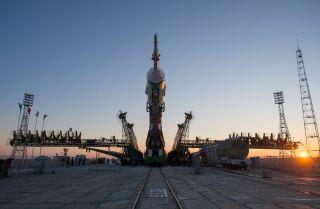 NASA astronaut Tom Marshburn, Russian Federal Space Agency cosmonaut Roman Romanenko, and Canadian Space Agency astronaut Chris Hadfield are due to blast off aboard a Russian Soyuz spacecraft from Kazakhstan's Baikonur Cosmodrome Wednesday at 7:12 a.m. EST (6:12 p.m. Baikonur time, or 1212 GMT). The three spaceflyers will join the three men already on the space station to round out the Expedition 34 crew. Marshburn, Romanenko and Hadfield are due to spend about five months in space, and Hadfield will take over control of the station in March 2013 when the Expedition 35 mission begins. Hadfield has been active on Twitter leading up to his flight, sharing memories from his previous two visits to space and thoughts on what's in store for him and his crewmates. "To deal with pre-flight jitters I focus on what matters, right now, & 1 min from now," he wrote today (Dec. 18) in response to a follower's question. "The entire event is too big & overwhelming." Marshburn, Romanenko and Hadfield will join current space station commander Kevin Ford of NASA, and Expedition 34 flight engineers Oleg Novitskiy and Evgeny Tarelkin, both cosmonauts. After the launch, it will take two days for the Soyuz TMA-07M spacecraft to catch up with the space station in orbit. Docking is expected on Friday (Dec. 21) at 9:12 a.m. EST (1412 GMT). Marshburn, who worked as a NASA flight surgeon before joining the astronaut corps in 2004, has one previous space shuttle flight in 2009 under his belt. Romanenko will also be making his second trip to space following a six-month stay on the space station in 2009. "We have to be plumbers, electricians, construction engineers, or workers, on the space station, but at the same time running a laboratory, being scientists, being the best laboratory assistants we can be," Marshburn told SPACE.com. "It's all in a bundle; it's very exciting, it's a lot of fun." The spaceflyers will be arriving at the station just in time to celebrate an orbital Christmas. "I think it will be a big adventure, a big moment in our space life," Romanenko said in a preflight NASA interview. "And we’ll be dressing up, we'll be decorating the station, we'll put up a Christmas tree, maybe we'll have some presents that will arrive on the cargo vehicles, which of course will make us very happy and will support us during this evening, this special time." The space station is also stocked with foods to make a traditional holiday feast, such as turkey, mashed potatoes, cornbread stuffing, and even cherry blueberry cobbler. "I believe there's a little tiny Christmas tree that's been up there for a few years," Marshburn said. "We'll pull it out." While the crew's time will be taken up with some space station maintenance work, and exercises to keep their bodies fit, the bulk of the spaceflyers' work will involve carrying out the 110 science experiments onboard the orbiting laboratory. "The space station is there for a purpose and that is to do science that can't be done on the surface of the Earth," Hadfield said in a NASA interview. "That is the core purpose of the space station, and so our job, as the people on board, is to make sure that that science gets done. Everything else is sort of downstream of that."